If you’ve been so busy working that you didn’t get out your Christmas cards, Techsnoop has rounded up some great resources to get you caught up. Use these free PSD files to send some personalized e-cards to family and friends. The creative touch will make up for your procrastination. Gavick.com has a great collection of vector and PSD icons and backgrounds for extra ho, ho, ho credits. From PSD Blast we get icons, wallpapers and some WordPress themes, all free. Please note; the WordPress themes seem to be old and may not work with the current version of WordPress. You may want to search for an update of the theme unless you are a WordPress master and can update them yourself. There are also some patterns and fonts available on this site. Have a Merry Christmas and Prosperous New Year from Techsnoop and DKemp Designs! Today’s free item is a collection of movie themed icons from Smashing Magazine. The set includes .png .jpg and PSD formats of tickets, popcorn, and other movie themed icons to use freely in any work you choose. Maybe you are blogging about a movie or created a website for a small indie production. These are great, ready to use icons to give any of your work a professional and polished appeal. Download here and don’t forget to give credit to the designer, Nikolay Kuchkarov for saving you hours of work. Welcome to Techsnoop Designs, your resource site for free design resources from around the web. Techsnoop Designs is the official design blog of DKemp Designs. All free resources formerly found on Techsnoop’s Helper will now be posted here. Techsnoop’s Helper will focus on games, gadgets, sci-fi, Social Media and the occasional miscellaneous fun post. Here on Techsnoop Designs, you will be able to find templates, brushes, PSDs, patterns, icons and tutorials, all free, all the time. At the time of posting, all resources listed are 100% free. However, some items may only be offered for a short time so be sure to sign up to get an e-mail whenever new items are posted. First up from one of our favorite sites, Smashing Magazine, a free e-commerce WordPress template, Balita. 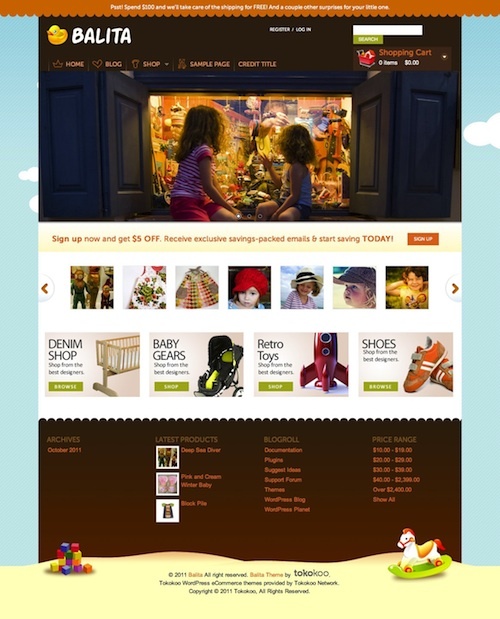 The theme is geared for selling children’s items and is completely free to use and customize. It even includes the e-commerce plug-in for generating your sales pages. Download here and let Smashing Magazine know you appreciate the help. If you need specific resources, let us know in the comments and we will try to find them for you.